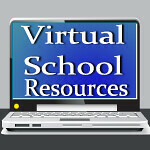 Virtual School Resources: Virtual School Resources is on hiatus! Virtual School Resources is on hiatus! You have probably noticed there has not been a lot of posting here. I have been extremely busy on my other blog, Virtually Yours, and it has become a full time job! I plan to continue to post about education on Virtually Yours, and eventually get my book finished! I haven't made the decision to give up Virtual School Resources, but there will definitely be very little posting here, at least through the end of the year. I hope you'll visit my other blog! Thanks to all my subscribers! No need to unsubscribe. I'll be back!